1.1 I forgot my password, how can I reset it? 1.2 How can I edit my profile information? 1.3 How do I upload a photo of myself to appear on my profile and other areas? 1.4 How can I change my password? 1.5 How do I change my display profile name? 1.6 How do I invite colleagues to join the Commons? 1.7 How do I change my display email? 1.8 What are mentions and how are they used? 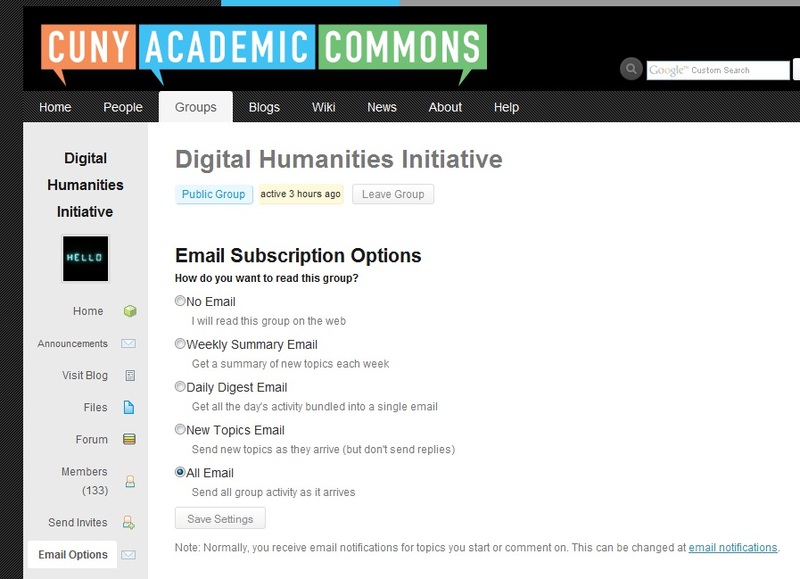 1.11 How do I change my email account where I receive email notifications through the Academic Commons? 1.12 How do I send a message? 1.13 How can I toggle my email notification settings? 1.14 Can member profiles be made private? How can I prevent my profile from showing up in a google search? 1.15 How Do I Delete My Account? 2.1 How can groups use the Commons? 2.2 How do I create and maintain a group? 2.3 What are the differences in permissions for the various group roles, i.e. Admins, Moderators, Members? 2.4 What’s the difference between public, private, and hidden groups? 2.5 I joined a hidden group and now can see it and all its members. Can everyone else? 2.6 Can I view a hidden group without being a member? 2.7 What happens when a private group becomes public? 2.8 How can groups share files? 2.9 How can groups work on documents collaboratively? 2.10 How can groups create a group web site that automatically makes group members subscribers to the site? 2.11 How can I attach an existing Commons site to a Group? 2.12 How come I’m not receiving Group updates via email? 2.13 I’m teaching a class on the Commons. How can I invite my students to join the Commons and to join my class ? 2.14 How can I leave a group? 2.15 How can I change my group email notifications? 2.16 How do I reply to email notifications? 3.1 How can I create a site? 3.2 Is there a limit on how many sites I can create? 3.3 Does the Commons offer domain mapping? 3.4 Where can I find help or guidelines for writing a blog? 3.5 What is the difference between a tag and a category? 3.6 What is the difference between a page and a post? 3.7 How can I password-protect my posts or make them private? 3.8 How can I adjust the privacy settings on my site? 3.9 How do I add individual users to my site? 3.10 How do I allow or deny comments on my site’s posts and pages? 3.11 What is spam? What can I do about it? 3.12 What types of files can I upload to my posts and pages? 3.13 How do I align images to the left or right in a site post? 3.14 How do I add PDF Files and MS Word documents to a post or page? 3.15 How do I make my front page display a static page rather than my most recent posts? 3.16 What’s a plugin? Where can I get help understanding what they do? 3.17 How do I let my readers control font size? 3.18 How do I delete my site? 4.1 How is the Wiki related to the Commons? 4.2 When I move back and forth between the Commons and the Wiki, do I have to log-in to each again? 4.3 Can I change my password on either log-in? If so, how? 4.4 How do I edit something on a Wiki page? 4.6 What types of files can I upload to the wiki? 4.8 How Can I Create a New Page? 4.9 How Can I Create a Hyperlink? 4.10 What is Page History and How Can I Use it to “Undo” an Edit I made? 4.11 How can I change the title or name of a page I created? 4.12 How do I upload images to a page on the wiki? 4.13 How do I embed video content into a wiki page? 4.14 Is there any “cheat sheet” available for wiki format shortcuts? 4.15 What is “My Watchlist”? 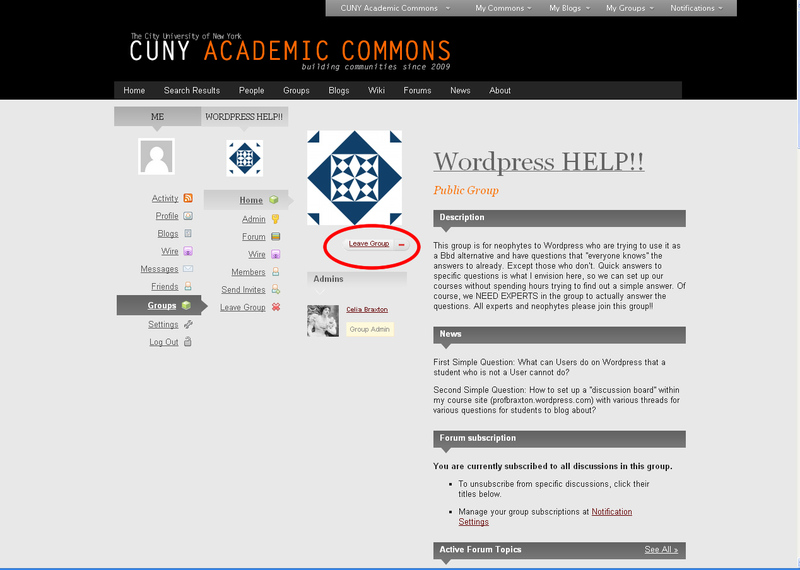 5.1 What platforms does the CUNY Academic Commons use? Resetting your password is a two-step process. After you click “log in” on the top navigation bar, select the link that says “forgot password?” (or just click this link here: https://commons.gc.cuny.edu/wp-login.php?action=lostpassword). You will be taken to a page where you need to enter your email address then click “get new password.” You should receive an email shortly thereafter that includes a link you need to click which will take you to a page where you can reset your password. After logging into the Commons, go to the top black navigation bar and hover over your avatar. Select: My Profile» Edit. From here you can update your display name, college, role, title, academic interests, websites, and additional profile fields that make up your Online CV. For more information, see Managing your Commons Profile/Portfolio. How do I upload a photo of myself to appear on my profile and other areas? After logging into the Commons, go to the top black navigation bar and hover over your existing (or default) photo. Go to My Profile»Change Profile Photo. Here you will find detailed instructions on how to upload an image. You can also create a gravatar, which will enable you to use that same image across many different types of websites. How do I invite colleagues to join the Commons? Members of the Commons can invite CUNY colleagues to become members and join specific groups. See the post in the Commons Codex to see how to combine these tasks. How do I change my display email? Please note: this will not update the email where you receive notifications from the Commons. See the FAQ below for instructions on updating your email notification address. What are mentions and how are they used? The @mention system links others to the hyperlinked profile of the individual while notifying the individual of the mention via email. If you are trying to reach out to specific group members, simply put the @ symbol in front of their username and it will send a notification to their email address and show up in their @mention activity stream. To learn more about the @mention system read this blog post. When you become friends with another member of the Commons, you will start seeing her/his activity on your “My Commons” page. It’s a great way to keep track of what’s going on the Commons that is relevant to you. To accept a friendship request, you can either follow the link in the e-mail you receive, or if your are logged onto the Commons, you will see a notification in the top right corner, to the left of your avatar. You’ll be directed to a web page that lets you to accept or reject the friendship request. The Notification link (on the top right bar of the Commons, just to the left of your avatar) indicates if you have a new message, friend request, or invitation to join a group. Zero indicates that you have no notifications. How do I change my email account where I receive email notifications through the Academic Commons? To send an email to another member, you can either find them on the member list or you can hover over your avatar in the top right corner, click the “My Messages” link on the left, and click “Compose.” Start typing the person’s first name in the addressee box and the program will give you a list of all the members whose names include the letters you’re typing. Next to the addressee box is an empty box for copying other members. Do the same thing in this box that you just did for the addressee. Each time, you do this, a new box will appear for another person to whom you might want to send a copy of the message. How can I toggle my email notification settings? Go to the top black navigation bar and hover over your avatar in the top right corner. Click My Settings >> Emai. Here you can choose whether you want to receive an email notification for a variety of activities, including posts to the groups you belong to, posts by your friends, posts to blogs you subscribe to, or follow, and messages. For further documentation, please see this wiki page. Can member profiles be made private? How can I prevent my profile from showing up in a google search? Right now, there is not a way to make Profiles private, but we can look into developing that functionality. For now, users worried about privacy should avoid using their full names on their profiles (some combination of initials and first or last names might be good). Certain profile fields can be made visible to only yourself, to your friends on the Commons, logged in members of the Commons, or the default – to everyone. To change profile field visibility, go to click on the “Change” hyperlink next to the text that reads: “This field can be seen by: Everyone Change.” Most, be not every field has this visibility setting. To delete your account, go to the top black navigation bar and hover over your avatar in the upper right corner. Click My Settings >> Delete Account, then follow the directions on the page. How can groups use the Commons? 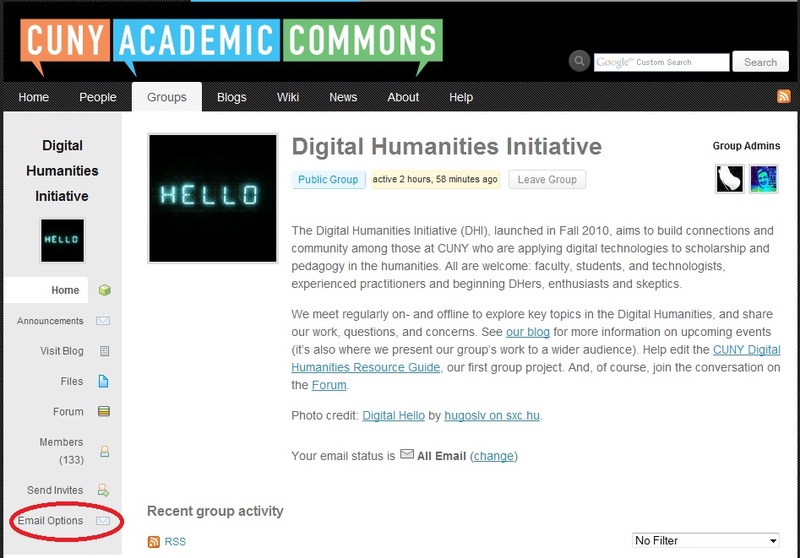 Please see this blog post on the Help blog: How groups can use the Commons. You can also check out the “Uses” and “Tools” tabs on Help & Support for more suggestions abut how to use the Commons. How do I create and maintain a group? To get a better understanding of how to create and maintain your group, please check out this blog post from the Help & Support. What are the differences in permissions for the various group roles, i.e. Admins, Moderators, Members? What’s the difference between public, private, and hidden groups? All content in public groups (member listing, forum posts, activity stream posts) is available to be viewed by anyone, even viewers who aren’t logged into the site. Public groups are listed in the public directory of groups, and any member of the community can join the group without seeking approval from the group owners. All content in private groups is hidden from the public and is viewable only by members of that group. Private groups are listed in the public directory of groups, but members of the community must request membership to the group and have that request approved before being able to view group content. All content in hidden groups is hidden from the public and is viewable only by members of that group. Hidden groups are not listed in the public directory of groups. New members must be invited to join by existing group members. I joined a hidden group and now can see it and all its members. Can everyone else? No. When users create or become members of hidden groups, they will see them in the group listing on the homepage, but it will be visible only to members of the group, not to the general public or to members of the Commons who aren’t in the group. Can I view a hidden group without being a member? Hidden groups aren’t listed in the groups directory, however, those with access to the group URL can view the group name and description. Group content and member information can only be accessed by members of a hidden group. What happens when a private group becomes public? When a private group becomes public, previous announcements will no longer be accessible to group members. For more information about changing a group’s privacy setting please refer to this post on the Commons Codex. How can groups share files? Check out this post to learn how groups can upload and share files. With the Commons 1.2 release, we’ve added a new feature called “Docs” which allows members to work on documents collaboratively. In order to eliminate confusion with “Docs”, we’ve changed the old “Documents” tab to “Files”. How can groups work on documents collaboratively? The docs feature in groups allows you to write and edit collaboratively with members of your groups. To learn more about this feature and how to activate it for your group please check out this page on the Codex. How can groups create a group web site that automatically makes group members subscribers to the site? We’ve enabled a pretty neat group blog function that makes it easy for group admins to attach a WordPress site to a group. Go to your group and click the “Admin” tab on the left-hand menu. Click ”enable group blog.” If you want to use an existing site, select ”Use one of my blogs.” Then select your web site. This will add all members of your group to your chosen site. You can also change the default permission level according to your needs. How can I attach an existing Commons site to a Group? To connect an existing site to a group, go to your group home page, and click “Admin” (yes, you need to be an administrator of the group to do this) > Click on Group Blog link > Check the box next to “enable group blog”. Type blog URL to connect the site to your group. That will add all members of your group to your chosen site.Currently, only one site can be attached to a group. How come I’m not receiving Group updates via email? First, please check your notification settings to make sure that you have set your preferences correctly. Second, please check your account’s spam filter or spam folder, as we have received several reports of group activity stream posts being caught by spam filters. Commons emails are sent from the address “noreply@commons.gc.cuny.edu,” so you may need to add that address to your contacts or to your spam filter’s whitelist. If you are still having problems, please contact us. I’m teaching a class on the Commons. How can I invite my students to join the Commons and to join my class ? Your class most likely is a group (but it might also have a group blog). See how to get new members signed up to both, in a one step process. Also, see the following page on Help & Support that describes how members use the Commons for graduate classes. To unsubscribe from a group, go to the group’s page and click ”Leave Group.” The link is right under the group icon image. Click here for a screenshot showing the the process. How can I change my group email notifications? For a comprehensive look at how to configure email notifications for all activity on the Commons, see this page. How do I reply to email notifications? There are two ways to reply to email notifications. You can click on the link supplied in the notification, log into the Commons, and reply; OR you can Reply By Email, from the comfort of your inbox. For more information about Reply by Email, follow this link. You can use Reply by Email to reply to discussion threads on group forums, to personal messages and @mentions, and to group announcements. How can I create a site? Login to the Commons at https://commons.gc.cuny.edu/ using the Login links in the upper right area of the page. While on the homepage, navigate to and select the “Sites” tab, which will bring you to the Sites Directory page. Click the “Create a Site” button next to the heading. Adjust “Site Visibility” according to your privacy needs. You can always change this setting later if you want by going the Settings>>Reading in your dashboard. Congratulations, you have just created a site! This screencast will also walk you through the process of creating a site on the CUNY Academic Commons. Is there a limit on how many sites I can create? No. You can create as many Web sites on the Commons as you want. Does the Commons offer domain mapping? Yes. If you choose to purchase (or already own) your own domain name – your site can be hosted on the Commons, but your site’s URL will be your own. Follow this link for more information. You can find “Best Practices” at WordPress’s Help at Writing Posts. Have a web site going already on the Commons? Check out Tweaking Your Site. Tags can also be displayed in “clouds” which show large numbers of tags in various sizes, colors, etc. Clouds provide a quick way to see predominate tags on the site, allowing people to see the sort of things your site is about. For more information on Tags and Categories, follow this link. A post is a chronological, journal style entry that has a date and time. A page is a more static type of entry and has the feel of a traditional website. If your site is a “blog” you probably will want your homepage to display your most recent posts. If your site is more of a traditional web site, you might want to assign one of your pages as your homepage. Follow this link for more information. How can I password-protect my posts or make them private? •“Private” (which means that only blog Editors and Administrators will be able to view your post). 3.Select “OK” then “Publish”/”Update”. These changes will go into effect immediately, but can be updated anytime if you choose to change the visibility of your post. How can I adjust the privacy settings on my site? To adjust the visibility of your individual/group site, please follow the 5 easy steps in this post. How do I add individual users to my site? Enter the member’s username (this can be found on their profile page). *Please Note- Only members of the Commons can be added to a site. How do I allow or deny comments on my site’s posts and pages? This setting may also be set globally by going to Settings>>Discussion and checking or unchecking the “Allow People to Post Comments” box. When you do this, the change will go into effect for all posts made in the future. What is spam? What can I do about it? Make sure that your site has the Akismet plugin activated. The Commons has a free license. Find out more about Akismet, and identifying spam at this post. What types of files can I upload to my posts and pages? How do I align images to the left or right in a site post? Please check out Michael Cripps’s wonderful guide to aligning images in WPMu. How do I add PDF Files and MS Word documents to a post or page? Please check out this post from the Help & Support blog. How do I make my front page display a static page rather than my most recent posts? This process takes a little time, but enables you to turn your blog into a website. What’s a plugin? Where can I get help understanding what they do? WordPress plugins extend the functionality of your site. They are add-on bits of code that let you do neat things. Follow this link for general information about plugins, and see Tweaking Your Site for a listing of popular WordPress plugins currently installed on the Commons, each with a link to a details page. How do I let my readers control font size? This wiki is powered by a software application called MediaWiki. The best places to find help for using this software are MediaWiki’s Help Pages, Wikipedia’s Tutorial, (because MediaWiki was written for Wikipedia), and Jim Groom’s MediaWiki Tutorials. Below are some selected help topics from the Wikipedia Tutorial. How is the Wiki related to the Commons? The Commons has (at least) four distinct components: blogs, forums, groups, and wiki pages. The Commons wiki is a repository of information that evolves as members share resources, annotate links and share ideas. Every member can edit any page (the only exception is the home page, which only administrators can edit). When I move back and forth between the Commons and the Wiki, do I have to log-in to each again? No, once you log-in to each part of the site, you can move between the two parts freely (unless you log-out). To log-in to the commons website click log-in on the top toolbar. Can I change my password on either log-in? If so, how? For the Commons: You must first log-in by clicking “Log In” in the gray toolbar on the top right of any page on the commons site. Then mouse over “My Account > Settings > General” Type in your new password twice and click save changes. How do I edit something on a Wiki page? You can read any page in the wiki without registering on it or logging in to it. But if you want to edit something, you must have an account on the Commons and be logged in to the site. You can find any “editable” page by finding it (by clicking View All Pages under Navigation on the right side of the screen). To edit it, click Edit (under Viewson the right side of the screen). When you’re editing a page, save the page after every edit (or every few minutes). If you don’t and if you go to a different page, you will lose every change you made! What types of files can I upload to the wiki? Permitted file types are png, gif, jpg, jpeg, png, gif, jpg, jpeg, doc, xls, mpp, pdf, zip, ppt, doc, pptx, docx. How Can I Create a New Page? Please view the screencast linked on this page. It’s easy to create a hyperlink in MediaWiki. In the “Rich Editor” there is an “Insert/Edit Link” Icon. Highlight the text you want to show underlined as a link, click the icon, and paste in your full url. Alternatively, you can quickly create a link by entering a square bracket, the full url, including the “http://”, a space and then the text your want to show as the link and finally a closing square bracket. What is Page History and How Can I Use it to “Undo” an Edit I made? All editable pages have an associated “page history,” which consists of a record of the date and time of every edit, the username of the user who wrote it, and the summary of the changes. To access a page’s history, clicking the “history” link in the View box (on the right). On the page that you would like to see the previous versions, in the “Views” toolbar click “History” and you will see a list of all previous edits. You can then compare versions (click “Compare selected versions”), see previous versions (click “last” next to the version you would like to see), or reload a previous version (click “undo”). Click here for a brief tutorial on using this history to undo an edit you made to a page. How can I change the title or name of a page I created? Click Move (under Views on the right side of the screen) and follow the directions. How do I upload images to a page on the wiki? How do I embed video content into a wiki page? For directions on how to embed video content, please see this wiki page. Is there any “cheat sheet” available for wiki format shortcuts? Yes. Please see this wiki page. What platforms does the CUNY Academic Commons use? Our MediaWiki Installation uses a few important extensions: the FCK Editor and the Uniwiki extensions.